I recently opened a 2006 Hong Tai Chang cake. This 400g ripe cake was purchased locally in Singapore and the Hong Tai Chang has a very pleasant unique ripe pu erh taste and aroma that is the signature of the tea company. My first encounter with Hong Tai Chang was a 2005 ripe cake in 2009 (see 27 Nov '09 blog entry). I enjoyed this tea very much and I do see this brand being sold on the internet and teashops worldwide. For your information, if you happen to be in Hong Kong, do pop by the Yue Hwa Chinese Emporium, go to the top floor and there is a whole floor of tea and tea products for sale there (go basement for the tinned oolongs). You can sample a few Hong Tai Chang tea there and buy a cake or two. I was there in Jan this year and the prices for this cake was less than US$25. The aroma and taste of this tea.......I like. It has hints of camphor, slightly minty with a nice herbal aroma. It has a mild sweet aftertaste as well. Please, if possible, sample this tea before you buy as your taste preferences could be different from mine. I have a tea friend who is indifferent to this tea, and would buy other ripe cakes instead. However, to me, this 400g Hong Tai Chang cake is one yummy tea. “It was a summer afternoon in Cambridge, England in the late 1920s. A group of university dons, their wives, and some guests were sitting around and outdoor table for afternoon tea. One of the women was insisting that tea tasted different depending upon whether the tea was poured into the milk or whether the milk was poured into the tea. The scientific minds among the men scoffed at this as sheer nonsense. What could be the difference? They could not conceive of any difference in the chemistry of the mixtures that could exist. A thin, short man, with thick glasses and a Vandyke beard beginning to turn gray, pounced on the problem. “…..The man with the Vandyke beard was Ronald Aylmer Fischer, who was in his late thirties at the time. He would later be knighted Sir Ronald Fischer. 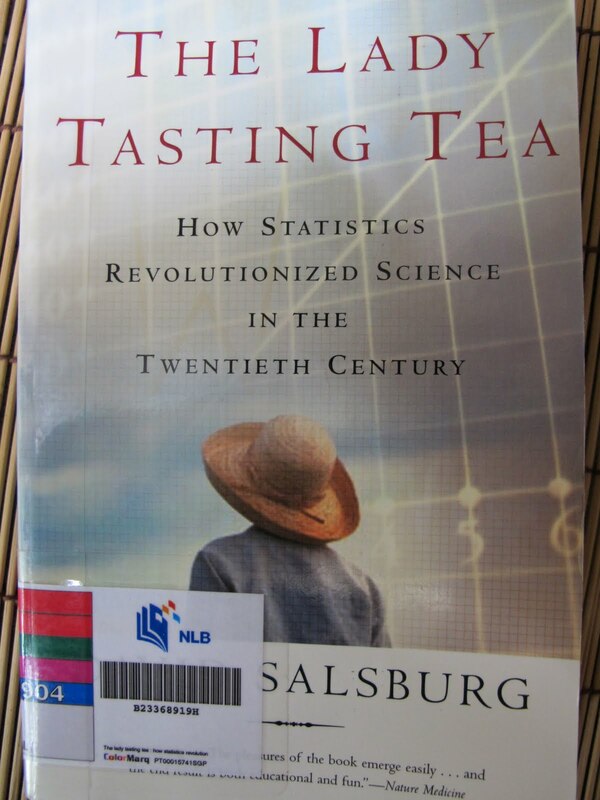 In 1935, he wrote a book entitled The design of Experiments, and he described the experiment of the lady tasting tea in the second chapter of that book. In his book, Fischer discusses the lady and her belief as a hypothetical problem. He considers the various ways in which an experiment might be designed to determine if she could tell the difference. 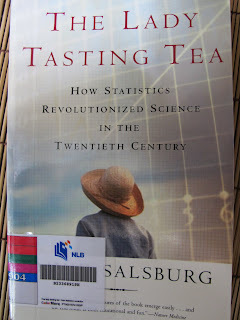 The problem in designing the experiment is that, if she is given a single cup of tea, she has a 50 percent chance of guessing correctly which infusion was served, even if she cannot tell the difference. If she is given two cups of tea, she might guess correctly. In fact, if she knew that the two cups of tea were each made with a different infusion, one guess could be completely right (or completely wrong). ……And the lady tasting tea, what happened to her ? Fischer does not describe the outcome of the experiment that sunny summer afternoon in Cambridge.. But Professor Smith told me that the lady identified every single one of the cups correctly." 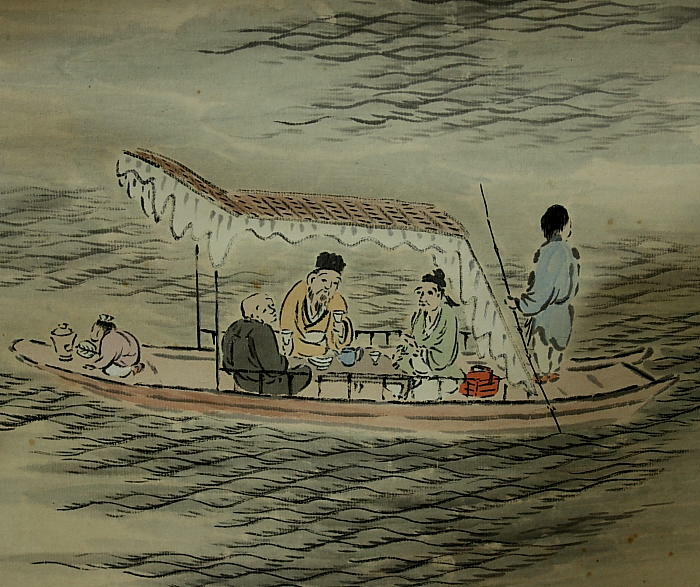 Today is the mid autumn festival. In Singapore, this festival is mainly celebrated by the eating of mooncakes and children carrying lanterns in the evenings. In the weekend newspaper, there was an article on mooncakes (click pix 1 for enlarged view). I noticed that the prices of these delicious sweet pastries have gone up substantially over these 3 years since I started this tea blog. It used to be $30 for 4 cakes.....now its close to $45-50. Yes, ingredients to make the cakes are now more expensive, but it is pretty obvious that the use of elaborate and intricate packaging had made the prices of these cakes over the moon. Looking at the above pix, you see mooncakes being packed in a chinese lantern, pix of celebrities on the box of one, and artistic designs in pix 2/3. Its difficult to make an argument, that such elaborate packaging is a waste, if the bottom line shows good profit for the mooncake bakeries. Anyway, I had also noticed that people here in Singapore are warming up to the use of using the internet when shopping. 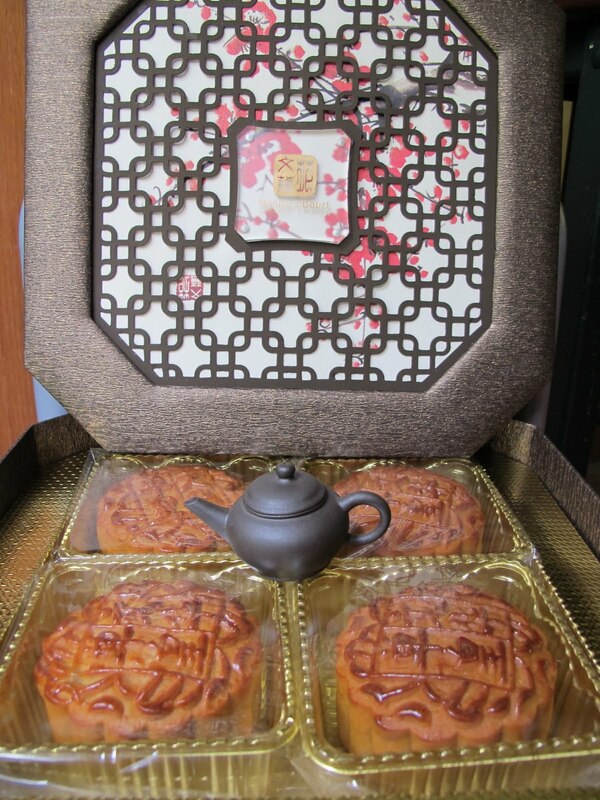 My wife used Groupon, to purchased a box of mooncakes (pix2) which gave some savings. I find that its quite useful especially when an item you need can yield some savings. Hold tight to your credit cards as impulsive buying may make a hole in your pocket. The bigger Chinese tea factories have also introduced some elaborate marketing strategies especially these 2 years. 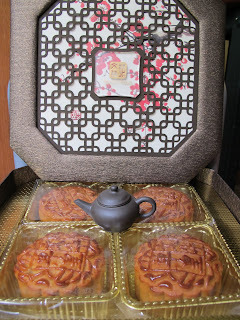 You would have noticed that for pu erh tea, there is an increase in special edition cakes. You have the gold labels, tinned and special wrapper versions, anniversary and commemorative cakes. I like to point out that these pu erh cakes/bricks do sell well. Collectors 'chase' after these cakes as they deemed these cakes as investments. Some of these tea were also bought and kept as trophies in their living room. I suppose it makes the house more cultured (joke joke). Its interesting to note that buying to drink these tea is not considered during such a purchase. Just my 2 cents worth of thoughts. Readers will know that I drink less raw pu erh compared to ripe pu. Reason being my stash of raw are relatively new about 5+yr old on the average. I found that new raw pu erh cakes though, perfectly fine to drink when new, does taste much better with aging and the taste is less harsh on the tongue (some people says it caused an upset tummy if they drank too much newer raw pu). 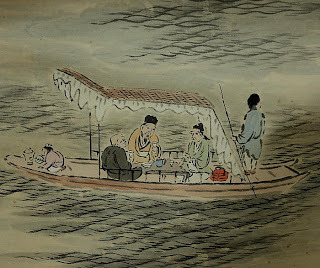 It was an article in a tea magazine, "Tea Art Magazine" (see blog 20 May 2011) that a review of some pu erh tea had the review panel confused over the oolong-like taste of the pu erh being sampled. In one of my tea purchases with Yunnan Sourcing, the proprietor Scott had included some samples of his in-house cakes and one of the samples was a 2009 "Ai Lao Jue Se". This was a 100% Ai Lao mountain pu erh tea. I made a brew of this tea and the results was, to me, a floral like scent with a nice flowery sweet finish. The brew had a light oolong tea characteristic. Most importantly, it did not had the harsh finish on my tongue which I had associated with new raw pu. Nice. I did some homework and these are my findings. Most of the new raw pu erh that has a slightly harsher finish are those raw pu erh that is a blend of pu erh leaves. Pu erh tea that is not a blend but comes and harvested from a single area or region is called single estate pu erh. The taste of this brew tend to be more drinkable, more floral like in the aroma and more pleasant in terms of mouth feel. I would like to qualify the previous statement as I have only tasted less than 6 single estate teas so far, in my findings for this blog. Popular pu erh recipes 7542 and 8582 are examples of pu erh that is a blend of pu from different regions of Yunnan. My teafriend, auhckw in Malaysia told me that single estate pu erh can be more expensive compared to the popular blends and there is a following of tea drinkers that drink and store single estate tea in Malaysia. When you buy your tea, whether single estate or blend - new or aged.......sample the tea and make a decision based on your preference. Will single estate or blends age better.....I cannot tell you which tea would be better but can assure you with proper storage your pu erh will develop its own unique aged taste and aroma. I found this 2005 cake at a local tea shop and from the wrapper, this stone pressed cake is from Ai Lao mountains. This tea has the same tea aroma and taste characteristics as the Ai Lao sample I mentioned earlier but it is more mellow overall - aftertaste stayed longer in the mouth. The tea did however gave me a sweaty sensation which lasted about a minute after drinking 2 teapots of this tea. A very interesting tea....quite refreshing actually.